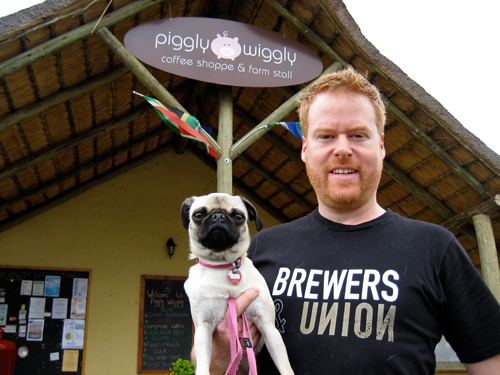 We rolled out on Saturday morning to head inland along the “Midlands Meander“, a tourism route that follows several small roads between Pietermaritzburg and the Drakensburg Mountains. It reminded us a lot of Bath County VA, with lots of little shops and hikes and quaint roadside stuff. The higher elevation means that the weather is almost always cooler than it is in Durban (they say it’s a great escape from the heat in the middle of summer), and Saturday’s cool cloudiness turned into a full-blown eerie fog later that night. Perfect weather for sitting by a fire (or under a propane heater, as the case may be). A great, easy escape — and one we look forward to doing again! First stop: the Piggly Wiggly coffee shop / produce market. We skipped the coffee and the veggies and headed straight for the champagne tasting. 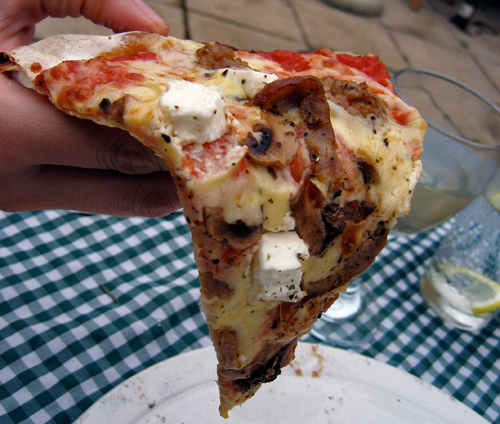 Lunch at Il Postino, where we had the BEST PIZZA WE'VE HAD IN AFRICA! So, so good. And with actual italian sausage! We're already scheming a return trip. 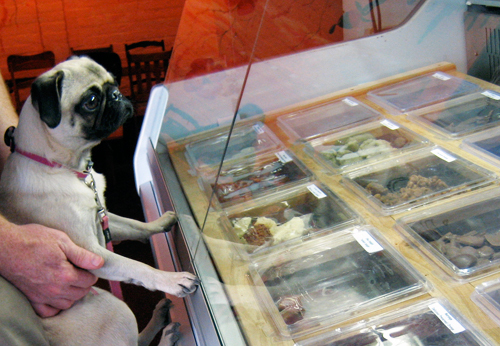 Roxy picks out some Belgian chocolates at Chocolate Heaven. The surprise winner was the cinnamon milk chocolate. Ungh!! 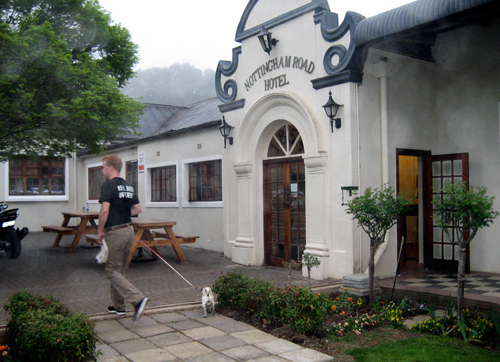 Our home for the night, the Nottingham Road Hotel. 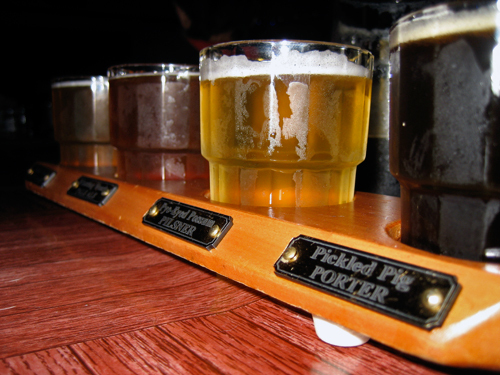 Bonus: the ground-floor pub is the hottest spot in the Midlands. Who knew? 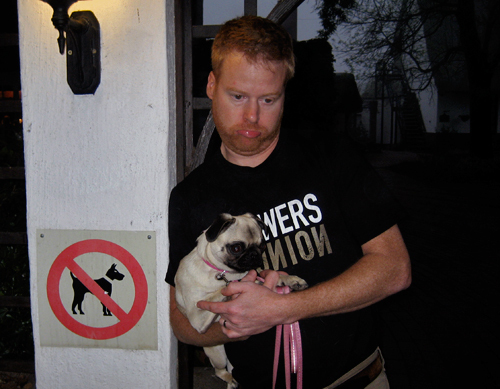 A common theme for the day: no dogs allowed. Each rejection sent us to somewhere more awesome though, so it's really just their loss! 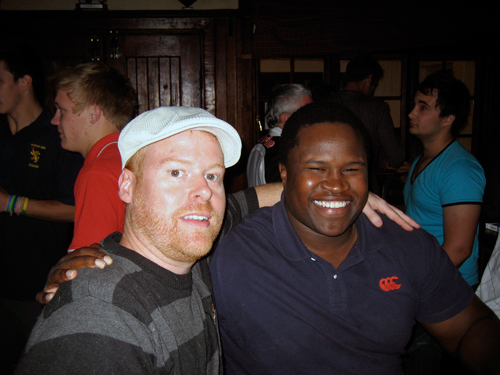 Beer sampling at the Bierfassel pub, where we watched rugby while toasting ourselves under a propane heater. Glorious! 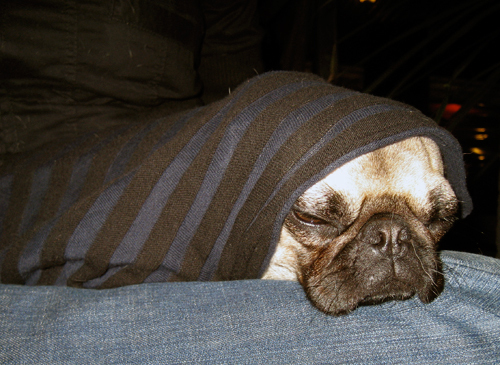 Roxy staying warm (sharing my scarf) at the Bierfassel. Johnny G with our new friend: a mormon Zulu named Washington. Nottie's Pub at the hotel. 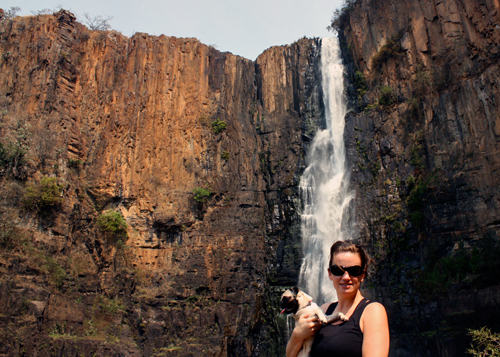 Sunday was hot and sunny, so we took a hike down to the bottom of the 95-meter Howick Falls (4th highest in SA). 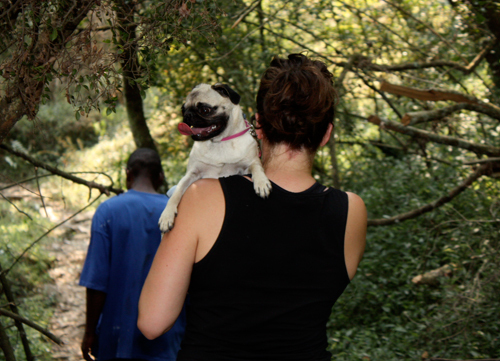 It was a bit hot for pugs that day, so I gave Roxy a lift for part of the climb back up. 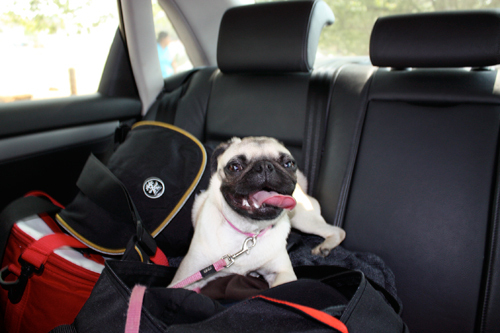 Rox definitely enjoyed the aircon for the ride home.